"The rebels have hired the most expensive mercenaries out of Europe." Well Go USA has released the new trailer for the release of the epic action movie Wolf Warrior II from China. If you haven't seen the first Wolf Warrior, don't worry, this will be just as fun to watch no matter what. Wolf Warrior II is already the most successful film ever released in China, making over $800 million in that country alone. 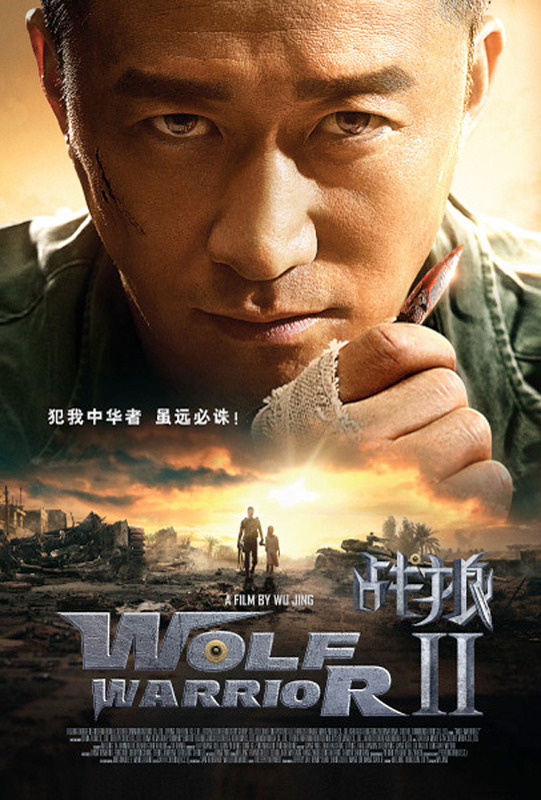 Wolf Warrior II (or Wolf Warrior 2) brings back Jing Wu, who stars and directs, as the "Wolf Warrior", China's deadliest Special Forces operative who must return to fight off mercenaries terrorizing innocent civilians. The cast includes Celina Jade, Gang Wu, Hans Zhang, Qian Yu, Nan Yu, Shanshan Chunyu, and Haifeng Ding. This looks like one of those action movies they don't make anymore, and I mean that in a good way. The Wolf Warrior is back, bigger and badder than ever, in this action-packed sequel to the 2015 hit. With his career in tatters, China's deadliest Special Forces operative has settled into a quiet life on the sea. But when he crosses paths with a sadistic band of mercenaries terrorizing innocent civilians, he must reaffirm his duty as a soldier and save the day once again. Fists (and bullets, tanks, missiles and much more) will fly in this adrenaline-fueled tour de force of bravura action filmmaking, all culminating into a climatic battle between the Wolf Warrior and the mercenary leader (Frank Grillo). Wolf Warrior II is directed by Chinese actor-turned-filmmaker Jing Wu, of the first Wolf Warrior and Legendary Assassin previously. The screenplay is written by Qun Dong, Yan Gao, Yi Liu, & Jing Wu. This first opened in China in July this year. Well Go will release Wolf Warrior II in the US direct-to-VOD starting December 12th. You down?